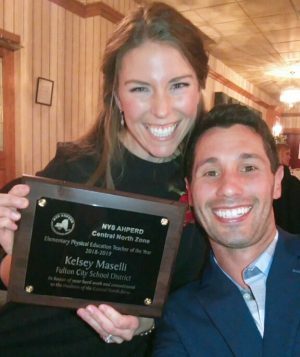 GRANBY – Granby Elementary School physical education teacher Kelsey Maselli was recently named elementary school physical education teacher of the year for the New York State Association for Health, Physical Education, Recreation and Dance Central North Zone. Granby Elementary School physical education teacher Kelsey Maselli proudly displays her plaque after receiving the elementary school physical education teacher of the year honor during the recent New York State Association for Health, Physical Education, Recreation and Dance Central North Zone conference. Alongside her, in a show of support, is colleague Jack Popper. As an annual attendant to the NYSAHPERD conference, Maselli said she had always soaked in all the information learned. She also has presented at zone conferences, attends as many as she is permitted and has presented on professional development opportunities within the Fulton City School District. She also has hosted fitness nights at Granby, attended and hosted after0school events, helped implement the school’s physical education hall of fame, assisted with the pilot of the region’s Healthy Highway program at Granby and she is currently organizing the CNY zone’s inaugural Leadership Awards program this year.